Does your church have a bell? More than one? Do you know when it is rung and why? Although bells are not as important in our daily life as they once were, they are still all around us. If we stop to think about it, we hear them from the chiming of the clock on the courthouse tower to the tinkle of the ice cream truck, the jingles tied on a baby’s shoes or the measured tones of a church bell. In times past almost every church had at least one bell, and many had several. Before the development of newspapers, radio, or TV, church bells warned of danger or announced the death of parish members. The bell would toll once for each year of the person’s life. They would also ring for happy occasions, such as weddings, or to announce great victories or important events. In Philadelphia, Pennsylvania, you can see the Liberty Bell, which was rung to announce the [USA’s] declaration of independence from England. On July 4, 1976, when the USA celebrated its bicentennial – the 200th birthday of the country – at 2 in the afternoon (EDT), President Gerald Ford rang the Liberty Bell and all the bells in the country began to chime, from electronic carillons to little backyard bells. The ringing of all these bells was a way of uniting the whole country at one single moment to celebrate 200 years of freedom. 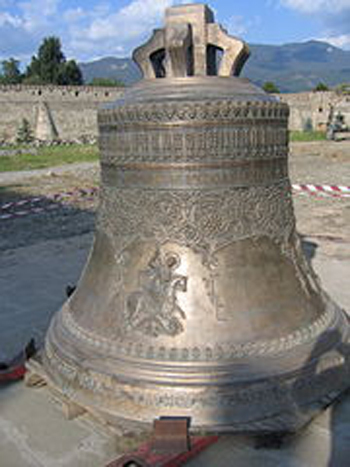 The origin of bells in Christian worship can be traced to the ram’s horns and silver trumpets used in the Old Testament to announce the beginning of a feast. The Book of Exodus mentions “gold bells and pomegranates”. Pictures of the fruit were embroidered around the hems of the priests’ robes, with a golden bell sewn between each pair. Every time the priest took a step, the music of the bells was like a little hymn, praising God. In some oriental cultures a gong was used rather than a bell. In North America and Africa, primitive tribes have shaken seed-filled rattles in religious ceremonies. Throughout history, many cultures have used these sounds to express their feelings of joy and sadness. During the first three centuries when Christians were not free to worship, there were special messengers who went from door to door to announce the services. Later they used trumpets, or wooden hammers with which they knocked on the doors. From this emerged a wooden plank struck with a wooden hammer. This has been preserved in the Orthodox Church on Mt. Athos, the holy mountain in Greece. On Mt. Athos, where there are many monasteries, they still use the semantron, the board and hammer, to call the monks to worship. It is said that the semantron, which some monasteries have named “Adam”, goes all the way back to Noah, who used it to call the animals to the ark. Just as the ark was the means of salvation from the flood, so the Church is the means of salvation from sin, and church bells call us to our salvation just as the semantron did in Noah’s time. Following the Greek custom, the first Russian churches and others used these wooden or iron boards, until later bells were introduced. In lands conquered by Islam, ringing church bells was forbidden and the church used the wooden board and hammer to call people together. Whenever Orthodox lands were freed of the Moslem yoke, the church bells joyously proclaimed their freedom. In churches which are fortunate enough to have them, bells are rung just before and at the beginning of the Liturgy to call the people together, during the singing of Holy God and It is meet, the hymn to the Theotokos, the Mother of God. In many churches, small hand bells are rung at the most solemn moments of the service inside. There are little jingling bells on the censer which make a lovely tinkling sound as the priest censes the church. Bells can be solemn, bells can be happy, but they always claim our attention. Church bells remind us that God is calling us all to Him. Reprinted with permission (minus illustrations) from Little Falcons, Vol. 4, Iss. 4, 1997 (Bells), pp. 4-7.